Opening hours: Normal opening hours for shops are 10 am-7 pm from Monday to Saturday. Some shops might be closed over lunch. On Sundays shops are normally closed or have reduced opening hours. Château d'If was, historically, France’s very own Alcatraz, built in 1527 and used as a prison in the 17th century. This place was the inspiration for Alexandre Dumas's novel "The Count of Monte Cristo", and occupies an island of its own 1.5 km offshore. 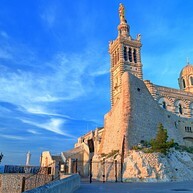 The defining symbol of Marseille towers on a hilltop 154 metres above the city, with the gilded statue of the Virgin Mary stretching skywards. The views from up here are simply stunning. Take the shuttle for convenience or embark on a just-under-an-hour-long hike up from the old port. There is a bustling fish market in the Vieux Port (old port) well worth exploring. The intense smell of fish and salty sea breeze contributes to making this experience engaging to the senses. 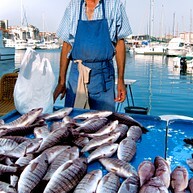 Why not buy some fresh fish and try your hand at the local speciality fish stew (bouillabaisse)? Abbaye Saint Victor is Marseille's oldest church. 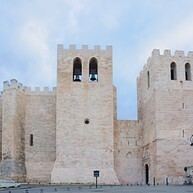 The abbey is built by the graves of Marseille’s first martyrs. Throughout history, the building was used as a church, prison, warehouse and barracks. Entry is free of charge, but a small fee is collected for seeing the crypt containing important historical artefacts and sarcophagi. 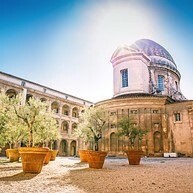 Musée d'Histoire de Marseille is an interesting and well-visited museum with historical and archaeological artefacts dating back to the city's founding times. 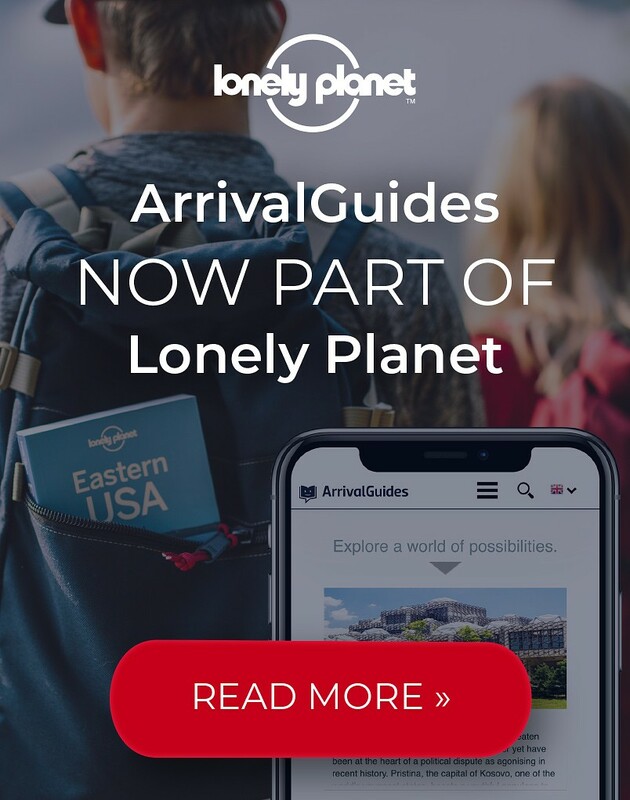 You can find it ideally located next to the Old Port. 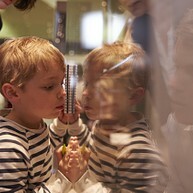 An English audio guide is available to visitors. 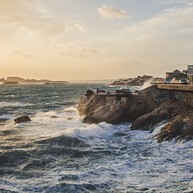 Located at the end of the corniche are the Plages du Prado, Marseille’s stretches of sandy beaches. With a steady sea breeze, the beaches are excellent for kite-flying or a first windsurfing lesson. Prado encompasses several compact beaches with multiple shopping and dining opportunities in the vicinity. Park Borély (Parc Borély) is a stunning development covering many hectares, situated not too far from the Prado beaches. Along with the 18th-century château, there are the superbly well-maintained English and French Botanical Gardens and a rowing lake. Roman Docks Museum (Musée des Docks Romains) is situated on the site of a Roman docks warehouse discovered after World War II. Here you can find a range of impressive artefacts discovered during the reconstruction of the old harbour. One of its primary attractions are the "dolia" - large ceramic containers once used to store oils and wines. 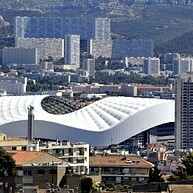 The Orange Vélodrome is where the official football club in Marseille, Olympique de Marseille, is based at. Attending a football game here is a lot of fun thanks to the lively atmosphere created by cheering locals, and will likely prove enjoyable even if football isn't exactly a passion of yours. Enjoy this romantic walkway along the sea and the stunning views that it provides. 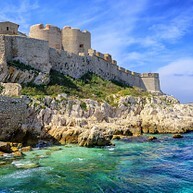 En route you will see the Château d'If, as well as beautiful coves called "calanques". The entire 12-kilometre long Corniche leading down to the Prado Beaches is best explored by bike, with stops for photos and dining. 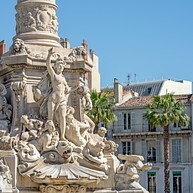 This is an impressive Marseille roundabout where many tourist photos have been taken. It is a major transport hub, whose focal point is a large fountain with an interesting obelisk statue. There are several cafés around the square's perimeter and off down the streets of the neighbourhood. A "calanque" is an inlet, cove or bay, and the ones you find outside Marseille are no less than mesmerising. The impressive limestone formations and the turquoise waters make for an excellent retreat. There are a wide range of sporting activities available here, as well as plenty of relaxation for the weary. The 17th century brought a cruel repression of beggars to France, and in Marseille many of them were imprisoned. Almshouses were opened to serve as workhouses for beggars and this specific building was just that. Nowadays the building, called La Vieille Charité in French, is a cultural centre and houses, among other things, museums such as the Museum of Mediterranean Archaeology and the Museum of Art of Africa, Oceania and Amerindia. This archaeological site (the local name Jardin des Vestiges) was discovered as constructions of a shopping centre commenced here in 1967. The garden contains an interesting mix of Greek and Roman remains. The majority of its finds are ruins of the old port. On the left hand side of the port you can find the Lighthouse Palace, a congress and conference building ideally located in a park with great views of the water and islands. Heralded as one of Marseille's most beautiful palaces, "Palais du Pharo" was first constructed for Napoleon III in 1858. 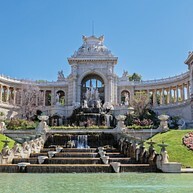 Palais Longchamp is an extraordinary, majestic building right in the middle of the city that throws you years back in time with its ornamental staircases and large fountains. The building houses the Musée des Beaux-Arts and the Natural History Museum.